Objective: This study aims to investigate the effects of berberine on the expression of nuclear factor erythroid 2-related factor 2 (Nrf2)/Heme Oxygenase 1 (HO-1) in retinal cells of diabetic rats. Methods: The diabetic rat models were established through intraperitoneal injection of streptozotocin. Different concentration (50 mg/kg/d, 100 mg/kg/d, 200 mg/kg/d) of berberine was orally administered to the rats for 4 weeks. After 4 weeks, changes of body weight, blood lipid and glucose were detected, and the expression levels of Nrf2 and HO-1 in retinal tissues were evaluated by immunohistochemistry and Western blot. Results: Four weeks of berberine intervention decreased blood glucose to below 16 mmol/L. Total Cholesterol (TC), Triglyceride (TG), and Low-Density Lipoprotein cholesterol (LDL) was decreased significantly, while High-Density Lipoprotein cholesterol (HDL) was increased significantly than that in the model group (P<0.05). The expressions of Nrf2 and HO-1 were also decreased in retinal cells after berberine treatment compared with those in the model group. Conclusion: Berberine can reduce blood glucose level in diabetic rats, improve blood lipid and decrease retinal vascular injury, suggesting it may be associated with the reduced expressions of Nrf2/HO-1. Diabetic vascular disease is one of the major complications contributing to disabilities and deaths of Diabetes Mellitus (DM), leading to 60%-70% of all deaths caused by diabetics [1,2]. These complications including: retinopathy, coronary heart disease, cerebral infarction, cerebral haemorrhage, lowers extremity atherosclerosis, and plaque . Nuclear factor E2-related factor (Nrf2) plays an important protective role in the oxidative stress in diabetic vascular disease . Through interacting with the Antioxidant Response Element (ARE) on genes, Nrf2 activates the expressions of downstream phase II detoxification enzymes, which plays effects of anti-ROS . Heme Oxygenase 1 (HO-1) is involved in processes like antioxidant, anti-inflammation, apoptosis inhibition, and anti- ROS in cells. The anti-oxidative stress of HO-1 has a protective effect for diabetic microangiopathy [6,7]. Studies [8,9] have shown that the oxidative stress injury of kidney was ameliorated after diabetic mice being fed with 1% tert-Butylhydroquinone (tBHQ). And the expressions of Nrf2 factor and HO-1 are significantly increased, which indicates the up-regulated HO-1 expression is positively correlated to the activation of Nrf2 . Berberine can reduce blood glucose in patients with type II diabetes through anti-inflammation and antioxidant . There is no report about whether berberine can regulate diabetic microangiopathy through intervening oxidative regulation. So we postulate that berberine can protect the endothelial damage in diabetes through activating Nrf2/HO-1 expression. Diabetic Retinopathy (DR) is one of the typical diabetic microangiopathy, so we established type II diabetic rat model in this study. Focusing on retinal vascular disease, we observed the expression changes of Nrf2/HO-1 in retinal vessel of diabetic rats after berberine intervention. Our finding provides insight for the prevention and treatment to vascular complications of diabetes by berberine. Sixty healthy Specific Pathogen Free (SPF) Wistar male and female (1:1) rats (weight: 180-200 g, 4 weeks old) were provided by Experimental Animal Center of Luzhou Medical School (Animal Certificate of Conformity: SCXK 2013-065, Luzhou, China). All animal experiments were performed in accordance with Guide for the Care and Use of Laboratory Animals issued by the State Council. Rats were divided into: berberine intervention group (n=30), normal control group (n=15), and diabetes model group (n=15). The berberine intervention group consisted of three subgroups (n=10) with different concentrations of berberine (50 mg/kg/d, 100 mg/kg/d, 200 mg/kg/d). The 3 doses of berberine were orally administered once daily for 4 weeks. The streptozotocin (Sigma, CA, USA) was prepared with 0.1% pH 4.5 citrate buffer, and then was intraperitoneally injected to rat at concentration of 55 mg/kg to induce diabetes in rats. After injection for 72 h, the tail blood glucose was measured for each rat for three consecutive days. If the blood glucose level exceeded 16.7 mmol/L, then diabetic rat models were successfully established. The blood glucose in tail vein was measured by JPS-5 Handheld rapid whole blood glucose tester (Beijing Yicheng Electronic Technology Co., Ltd., Beijing, China). After 4 weeks, 2% sodium pentobarbital (3 ml/kg) was used for anaesthesia; the whole blood was collected by cardiac puncture after quickly opening the chest. After centrifugation at 3000 g for 5 min, the Total Cholesterol (TC), Triglyceride ester (TG), Low Density Lipoprotein (LDL-C), High Density Lipoprotein Cholesterol (HDL-C) and Fasting Glucose (GLU) were measured by Hitachi 7180 type automatic biochemical analyser (Hitachi, Tokyo, Japan). Body weight was measured on the first day and on first day of the fourth week. Four rat eyes were isolated from rats in each group using a 19G stab knife gently puncturing the anterior chamber. Then eyes were fixed with 4% paraformaldehyde solution for more than 24 h. After dehydration and paraffin-embedding, the samples were cut into 4 μm successive sections. After routine dewaxing, 3% hydrogen peroxide (Beyotime Biotechnology, Shanghai, China) was added and incubated at room temperature within 10 min to inactivate endogenous peroxidase and repair antigen. After blocking by 5% BSA for 20 min, 1:500 diluted antibodies of Nrf2 and HO-1 (rabbit anti-rat, Beijing Bioss Company, Beijing, China) were added respectively. After incubation at 4°C overnight, biotinylated secondary antibody (goat anti-rabbit, Beyotime Biotechnology, Shanghai, China) was added for 40 min at room temperature. Strept Avidin-Biotin Complex (SABC) was added for 30 min and PBS washing was replicated for 4 times. DAB was applied for color development and haematoxylin was used to counter stain lightly for around 2 min. After dealt with hydrochloric acid and xylene, the slides were sealed with neutral gum for observation. We applied Leica DM4000B microscope and Image-Pro Plus Image Analysis system to analyse staining result. Brown or tan reaction regions in retinal area were randomly selected, and the average Absorbance (A) of the selected region was measured in each field by IPP software. Then the average was compared among different groups. After rat retinal tissues lysis, the lysate was centrifuged at 12000 g for 10 min and the supernatant was stored. The BCA assay was used to detect the protein concentration. The isolated protein was loaded into SDS-PAGE and then transferred to PVDF membrane for 120 min. The primary antibody was rabbit anti-rat Nrf2 and HO-1 (Beijing Bioss Company, Beijing, China). After incubation at 4°C overnight with primary antibody, TBST was used to wash membrane for 3 times. The secondary antibody was HRP-conjugated goat antimouse and goat anti-rabbit IgG. After washing, the membrane was developed by enhanced chemiluminescence plus reagent. We used β-actin as internal reference and applied Image proplus software to scan and estimate the absorbance value of protein bands. All the data were shown as the mean ± SD, and SPSS 17.0 software was used to analyse data. ANOVA or SNK method was performed to compare differences among groups. The non-parametric test was used if variance was heterogeneous. P<0.05 was considered as statistically significant. To study the effects of berberine on the physiological condition, we compared the changes of body weight, blood glucose, and blood lipids among different groups. At week 4, the body weight of rats from the berberine group was increased significantly than model group, although it was lighter than the normal control group (P<0.05). The blood glucose in model group reached to 29.01 mmol/L, and it was 25.61 mmol/L, 26.72 mmol/L, and 24.78 mmol/L in the berberine group, which indicated the diabetes models were successfully constructed. After four weeks of berberine intervention, the blood glucose was decreased to below 16 mmol/L, which was significantly lower than the model group (P<0.05) although it was still higher than the normal control group. Compared with the normal control group, TC, TG, and LDL were increased and HDL was decreased significantly in the model group. After berberine intervention, TC, TG, and LDL were decreased significantly than those in the model group, while HDL was increased significantly (P<0.05). All results are shown in Figures 1A-1C. The results indicated that berberine was beneficial to diabetes rat and can improve their physiological conditions. 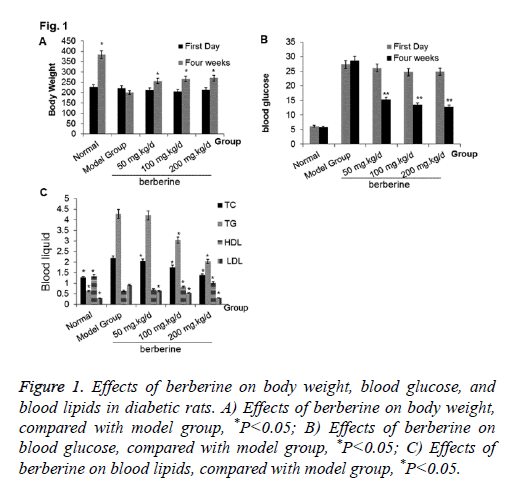 Figure 1: Effects of berberine on body weight, blood glucose, and blood lipids in diabetic rats. A) Effects of berberine on body weight, compared with model group, *P<0.05; B) Effects of berberine on blood glucose, compared with model group, *P<0.05; C) Effects of berberine on blood lipids, compared with model group, *P<0.05. To explore the roles of berberine in regulating the expressions Nrf2 and HO-1 , we applied immunohistochemistry to check the expression of Nrf2 and HO-1 in retina of diabetic rats. As shown in Figure 2, the expressions of Nrf2 and HO-1 were very low in the normal control group, which increased significantly in the model group. After berberine intervention, the expressions of Nrf2 and HO-1 were significantly decreased than those in the model group (P<0.05), although the expressions were still higher than that in the normal control. The results indicated that berberine down-regulated the expression of Nrf2 and HO-1 in retina of diabetes rat model. Figure 2: Effect of berberine on Nrf2, HO-1 expression in retina of diabetic rats. A). Detection of Nrf2 and HO-1 expression in retina of diabetic rats by immunohistochemistry method; B). 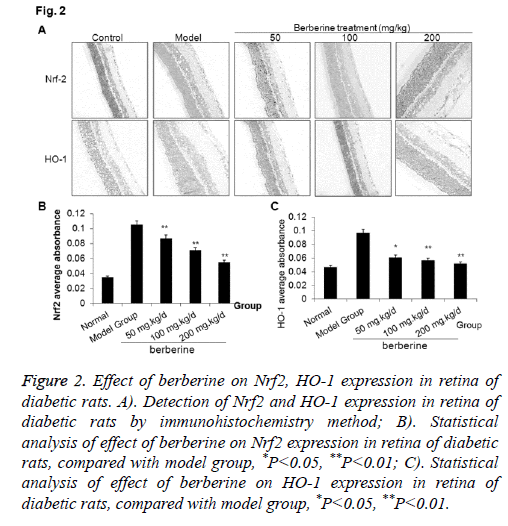 Statistical analysis of effect of berberine on Nrf2 expression in retina of diabetic rats, compared with model group, *P<0.05, **P<0.01; C). Statistical analysis of effect of berberine on HO-1 expression in retina of diabetic rats, compared with model group, *P<0.05, **P<0.01. To validate the effect of bebeerine on the expressions of Nrf2 and HO-1 , we applied Western blot to estimate the expression of Nrf2 and HO-1 in retina tissues of diabetic rats. As shown in Figure 3, the expressions of Nrf2 and HO-1 were very low in the normal control group, while increased significantly in the model group. In the berberine intervention group, the expressions of Nrf2 and HO-1 were significantly downregulated than those in the model group (P<0.05), although the expressions were still higher than that in the normal control. The results indicated that berberine down-regulated the expression of Nrf2/HO-1 in retina tissues of diabetes rat model, which was consistent to the results from immunohistochemistry. Figure 3: Western blot to detect the effect of berberine on Nrf2, HO-1 expression in retina tissues. 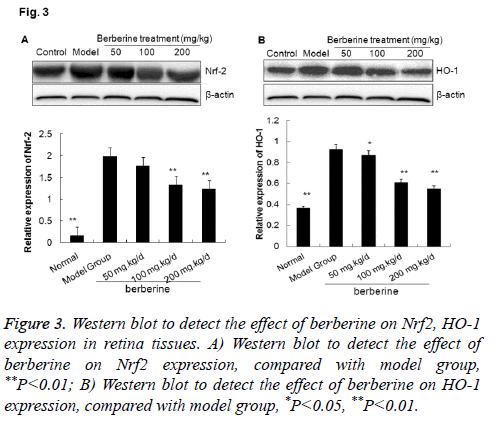 A) Western blot to detect the effect of berberine on Nrf2 expression, compared with model group, **P<0.01; B) Western blot to detect the effect of berberine on HO-1 expression, compared with model group, *P<0.05, **P<0.01. Diabetes is a serious complex condition that affects human health. It can cause macrovascular and microvascular damage and endanger the heart, brain, kidney, peripheral nerves, eyes, and feet . Vascular endothelial injury is a precondition for diabetic vascular complications, and high concentration of glucose increases endothelial cell stresses and induce injury of vascular endothelium . Diabetic Retinopathy (DR) manifests in pathological changes in small blood vessels and microvasculars, and belongs to microangiopathies. Its development is associated with increased blood sugar, Advanced Glycation End products (AGEs), inflammatory reaction, and abnormal oxygenation . Studies show that high glucose is an important cause for endothelial damages. It induces lipid peroxidation, increases oxygen free radicals, and accumulates oxidized Low-Density Lipoprotein (oxLDL), impairs the tight junctions among endothelial cells and increase permeability . Up-regulated cytokines can induce the reduction of myocardial capillary and the thickness of basement membrane . In this study, body weight was increased and blood glucose was decreased after berberine intervention, indicating that berberine had a certain anti-diabetic effect. Further analysis of the plasma lipid showed that berberine down-regulated TC, TG, LDL and to up-regulated HDL, indicating that berberine can regulate lipid in blood. As Nrf2 and HO-1 play important roles in the antioxidation in diabetes, we focused on retinal vasculopathy to further analyse whether berberine can reduce diabetic vasculopathy through regulating the expressions of Nrf2 and HO-1. Under normal condition, the excess of ROS is cleared by antioxidant defense system. But in condition of sustained high glucose in diabetes, large amounts of ROS were produced as mitochondrial dysfunction, and the antioxidant defense system was damaged in this setting. Then ROS damage is induced, which further leads to diabetic vascular complications such as diabetic retinopathy. Nrf2 is a transcription factor and induces self-protection in cells . Nrf2 can activate the expressions of phase II detoxification enzymes and anti-oxidant enzymes to function as anti-ROS . Nrf2 expression is usually increased in diabetes to relieve the injury by ROS stimulus [18,19]. Several studies confirmed that Nrf2 knockout decreased antioxidant genes expression and increased oxidative injury in mouse, indicating that Nrf2/ARE pathway is a key regulator of body’s redox state. Activated Nrf2/ARE signalling pathway can induce up-regulation of antioxidant proteins and antiinflammatory factors. Nrf2 is expressed in a variety of cells in retina, and ROS expression is significantly higher in Nrf2-/- diabetic mouse than in Nrf2+/+diabetic mouse . HO-1 is an antioxidant protein and the rate-limiting enzyme of heme degradation, which participates in antioxidation, antiinflammatory, apoptosis inhibition, and anti-ROS damage. HO-1 expression is significantly higher in type 2 diabetes than in pre-diabetes, which is also positively correlated with large artery disease . The oxidative stress and increased excitotoxicity metabolites in diabetes can induce mitochondrial dysfunction to produce large amounts of free radicals, lipid peroxidation, oxidation reaction vigorously, and apoptosis. When Nrf2 expression is increased, HO-1 is up-regulated significantly, indicating that increased HO-1 expression is mediated by the activation of Nrf2 . Nrf2 is usually localized in the cytoplasm, and enters into nucleus to bind with ARE of genes. Then the down-stream antioxidant genes like HO-1 are induced to express and enhance antioxidant defense . The results showed berberine down-regulated the expressions of Nrf2 and HO-1 in model group, which indicated that the reduction of oxidation reaction by berberine may be associated with the decreased expressions of Nrf2 and HO-1. In summary, berberine can reduce the level of blood glucose, reduce the expression of Nrf2 and HO-1 in retina of diabetic rats, suggesting inhibition on Nrf2 and HO-1 expression may contribute to the protection mechanism in endothelial injuries in diabetes. The authors want to thank Dr. Peng Liu from Endocrinology Department, Laiwu City People’s Hospital for his valuable help. Avogaro A, Rattazzi M, Fadini GP. Ectopic calcification in diabetic vascular disease. Expert OpinTher Targets 2014; 18: 595-609. Sena CM, Pereira AM, Seica R. Endothelial dysfunction - a major mediator of diabetic vascular disease. BiochemBiophysActa 2013; 1832: 2216-2231. Sayin N, Kara N, Pekel G. Ocular complications of diabetes mellitus. World J Diabetes 2015; 6: 92-108. Cheng X, Chapple SJ, Patel B, Puszyk W, Sugden D, Yin X, Mayr M, Siow RC, Mann GE. Gestational diabetes mellitus impairs Nrf2-mediated adaptive antioxidant defenses and redox signalling in fetal endothelial cells in utero. Diabetes 2013; 62: 4088-4097. Wang X, Hai CX. ROS acts as a double-edged sword in the pathogenesis of type 2 diabetes mellitus: is Nrf2 a potential target for the treatment? Mini Rev Med Chem 2011; 11: 1082-1092. He M, Siow RC, Sugden D, Gao L, Cheng X, Mann GE. Induction of HO-1 and redox signalling in endothelial cells by advanced glycation end products: a role for Nrf2 in vascular protection in diabetes. NutrMetabCardiovasc Dis 2011; 21: 277-285. Adaikalakoteswari A, Balasubramanyam M, Rema M, Mohan V. Differential gene expression of NADPH oxidase (p22phox) and hemoxygenase-1 in patients with type 2 diabetes and microangiopathy. Diabet Med 2006; 23: 666-674. Li J, Johnson D, Calkins M, Wright L, Svendsen C, Johnson J. Stabilization of Nrf2 by tBHQ confers protection against oxidative stress-induced cell death in human neural stem cells. ToxicolSci 2005; 83: 313-328. Alarcon-Aguilar A, Luna-Lopez A, Ventura-Gallegos JL, Lazzarini R, Galvan-Arzate S, Gonzalez-Puertos VY, Moran J, Santamaria A, Konigsberg M. Primary cultured astrocytes from old rats are capable to activate the Nrf2 response against MPP+ toxicity after tBHQ pretreatment. Neurobiol Aging 2014; 35: 1901-1912. Qiu C, Hevner K, Enquobahrie DA, Williams MA. Maternal serum heme-oxygenase-1 (HO-1) concentrations in early pregnancy and subsequent risk of gestational diabetes mellitus. PLoS One 2012; 7: e48060. Pang B, Zhao LH, Zhou Q, Zhao TY, Wang H, Gu CJ, Tong XL. Application of berberine on treating type 2 diabetes mellitus. Int J Endocrinol 2015; 2015: 905749. Kowluru RA, Chan PS. Oxidative stress and diabetic retinopathy. Exp Diabetes Res 2007; 2007: 43603. Tabak O, Gelisgen R, Erman H, Erdenen F, Muderrisoglu C, Aral H, Uzun H. Oxidative lipid, protein, and DNA damage as oxidative stress markers in vascular complications ofdiabetes mellitus. Clin Invest Med 2011; 34: E163-171. Singh R, Barsen A, Mori T, Beilin L. Advanced glycation end products: a review. Diabetologia 2001; 44: 129-146. Qi Nan W, Ling Z, Bing C. The influence of the telomere-telomerase system on diabetes mellitus and its vascular complications. Expert OpinTher Targets 2015; 19: 849-864. Zhong Q, Mishra M, Kowluru RA. Transcription factor Nrf2-mediated antioxidant defense system in the development of diabetic retinopathy. Invest Ophthalmol Vis Sci 2013; 54: 3941-3948. Fan J, Xu G, Jiang T, Qin Y. Pharmacologic induction of heme oxygenase-1 plays a protective role in diabetic retinopathy in rats. Invest Ophthalmol Vis Sci 2012; 53: 6541-6556. Mishra M, Zhong Q, Kowluru RA. Epigenetic modifications of Nrf2-mediated glutamate-cysteine ligase: implications for the development of diabetic retinopathy and the metabolic memory phenomenon associated with its continued progression. Free RadicBiol Med 2014; 75: 129-139. Xu Z, Wei Y, Gong J, Cho H, Park JK, Sung ER, Huang H, Wu L, Eberhart C, Handa JT, Du Y, Kern TS, Thimmulappa R, Barber AJ, Biswal S, Duh EJ. NRF2 plays a protective role in diabetic retinopathy in mice. Diabetologia 2014; 57: 204-213. Wang C, Li C, Peng H, Ye Z, Zhang J, Liu X, Lou T. Activation of the Nrf2-ARE pathway attenuates hyperglycaemia-mediated injuries in mouse podocytes. Cell PhysiolBiochem 2014; 34: 891-902. Mishra M, Zhong Q, Kowluru RA. Epigenetic modifications of Keap1 regulate its interaction with the protective factor Nrf2 in the development of diabetic retinopathy. Invest Ophthalmol Vis Sci 2014; 55: 7256-7265. He M, Pan H, Xiao C, Pu M. Roles for redox signaling by NADPH oxidase in hyperglycemia-induced heme oxygenase-1 expression in the diabetic retina. Invest Ophthalmol Vis Sci 2013; 54: 4092-4101. Uruno A, Furusawa Y, Yagishita Y, Fukutomi T, Muramatsu H, Negishi T, Sugawara A, Kensler TW, Yamamoto M. The Keap1-Nrf2 system prevents onset of diabetes mellitus. Mol Cell Biol 2013; 33: 2996-3010.